Figure A42. Idaho anomaly, interpreted as the Idaho slab, with (horizontal) [vertical] cross sections through (A)[D] the UUP07 p-wave) and (B)[D] the combined SL2013 and S40RTS s-wave models at 1370 km; C) the location of the modern geological record that we interpret to have formed during the subduction of the slab. 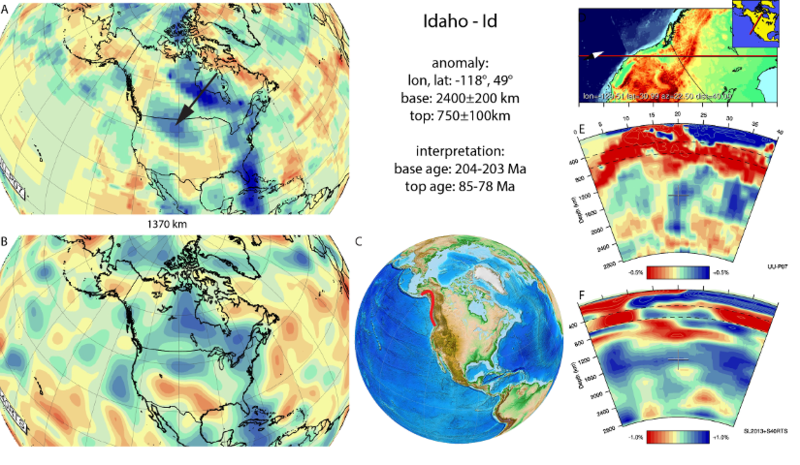 The Idaho anomaly (Figure A42) is located below western North America from the deep mantle up to upper part of the lower mantle. It was interpreted as the Idaho slab by van der Meer et al. (2010) and corresponds to the S2 anomaly of Sigloch et al. (2008) and Shephard et al. (2013) and Cascadia Root (CR) anomaly of Sigloch and Mihalnyuk (2013). It has been interpreted as Farallon lithosphere that subducted in the Cenozoic Sigloch et al. (2008) and Shephard et al. (2013) or as lithosphere of the Kula plate that subducted in the Cretaceous (Ren et al., 2007; Shephard et al., 2013). Sigloch et al. (2008) suggested that the Idaho slab subducted after, and below the northern extent of the Farallon slab to the NE (defined here as the Hudson slab) after the Hudson slab broke off in the late Cretaceous. Van der Meer et al. (2010) argued that such an interpretation would require that the Hudson slab remained stagnant in the mantle since the Late Cretaceous, whereas the Idaho slab sank rapidly into the lower mantle, which they considered unlikely. Instead, they followed Nokleberg et al. (2000), who reconstructed northward to eastward subduction of Farallon/Panthalassa lithosphere in the latitude range of the Idaho slab based on paleomagnetic data from the northern parts of the Wrangellia terrane. The Wrangellia terrane comprises of four island arcs, the Devonian Sicker, the late Paleozoic Skolai, the Late Triassic and Early Jurassic Talkeetna-Bonanza, and the Late Jurassic through mid-Cretaceous Gravina arcs (Nokleberg et al. 2000). Van der Meer et al. (2010; 2012) interpreted the Idaho slab as Farallon/Panthalassa lithosphere resulting in the Talkeetna-Bonanza and Gravina arcs. U-Pb zircon ages of midcrustal plutons of he Bonanza arc show that these were emplaced between 203.8 Ma and 164 Ma (Canil et al. 2012, D’Souza et al. 2015). Based on their present-day relative locations between the Mendocino (section 3.59) and Idaho slabs and arcs, we tentatively suggest that the Idaho slab is correlated with the Bonanza arc. Following one of the accretion scenarios of Nokleberg et al. (2000), end of subduction and accretion to the continental margin was modelled by Shephard et al. (2013), who modelled accretion to occur at 140 Ma. However, Sigloch and Mihalynuk (2013), suggested that the final terrane accretion occurred later at 55–50 Myr ago. However,this late accretion date is specifically referring to the Siletzia terrane, which may be mostly a large igneous plateau related to the Yellowstone plume (Wells et al. 2014) and therefore not the result of subduction. Gehrels et al. (2009) argued that on the basis of U-Pb and Hf isotope analysis of detrital zircons from strata of the Gravina belt that during the mid-Cretaceous the Gravina belt collapsed and the Alexander-Wrangellia terrane was accreted until 85 Ma to the Stikine and Yukon Tanana terranes at the continental margin. High-flux magmatism continued during this accretionary event at 100–80 Ma, which we associate with the final intra-oceanic arc accretion A dramatic reduction in magmatic flux occurred at ca. 78 Ma, which continued until ca. 55 Ma. We therefore associate a break-off age of 85-78 Ma in our current compilation, defining the top of the Idaho slab. About two thirds of the way down this paragraph there is a small typo: “we tentatively we suggest”. Otherwise fascinating.